It's fertile review season just after a brand-new graphics architecture launches. 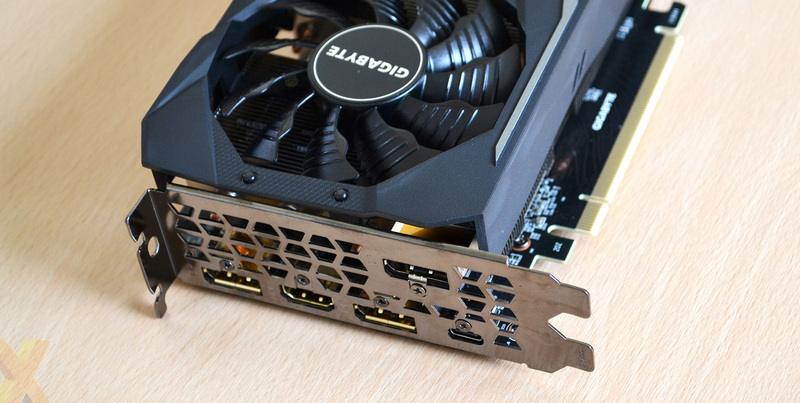 Nvidia's Turing GPU powers the GeForce RTX 2080 Ti and RTX 2080 cards, and it is interesting to see the green team come out swinging with big-chip designs, reversing a long-term trend of going for mainstream first. What this means is that said cards aren't cheap. RTX 2080 starts at £750 and goes up to a grand, while the more muscular Ti comes in at £1,100. Ouch, as many have opined. Still, early adopters tend to look past the financial outlay and lay down serious cash for shiny technology. We have already seen the RTX 2080 Founders Edition strut its stuff, EVGA's come on the scene with the big, bold XC Ultra Gaming, and now it is the turn of dual-source partner Gigabyte to show what it can do. This here is one of three Gigabyte RTX 2080 models. Known as the Gaming OC, it sits bang in the middle of Gigabyte's pecking order - above the WindForce OC but below the Xtreme. The real-world implication is that it runs the boost clock at 1,815MHz out of the box (Gaming Mode), which can be upgraded by a further 15MHz by activating OC through Gigabyte's Windows-based software. Memory is left untouched at the standard 14,000MHz. A second BIOS position with the OC clock would have been better. As you may know by now, the original raft of cards are based on the Nvidia reference PCB, so it's no surprise to see this variant measure 286mm long, 114mm tall and 50mm thick. The last dimension is telling insofar as the card is a tad higher than the strict two-slot form factor. You need to invest in the WindForce OC (40mm tall) if space may be an issue. 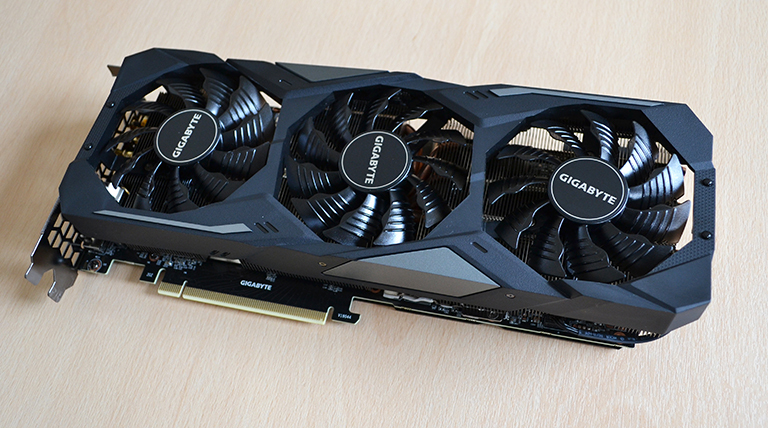 You may think it is a brute of a card, but the 998g weight makes it some 300g lighter than the FE or EVGA. As such, it does not sag when installed in a PC. The cooler uses three distinct heatsinks that are effectively connected together via a total of seven heatpipes. The reason for going down this route is because the reference board features VRMs on both sides of the GPU, meaning that anyone not cooling the I/O side isn't doing a good job. 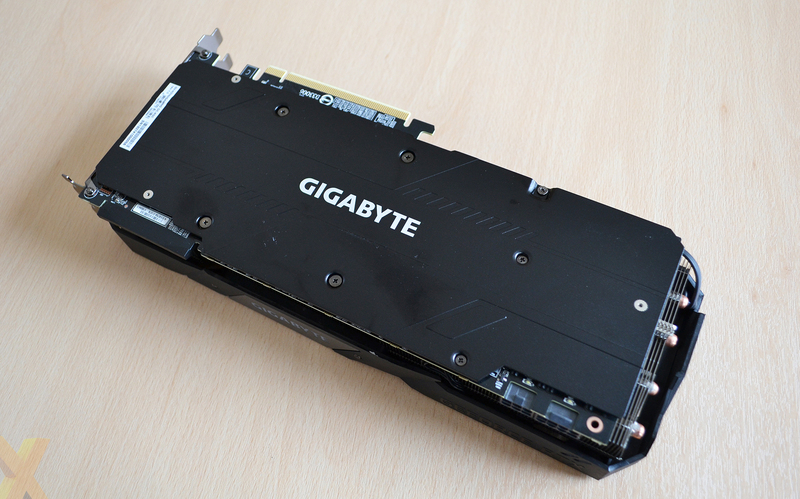 There are a number of thick heatpads between the inductors and the right-hand heatsink, and Gigabyte chooses to cool the GDDR6 memory with a large plate that also connects to the GPU. Having both in direct contact with the cooling makes sense because of the sheer mass present here. Looking around the board, Gigabyte has a fan header on each side for the trio of spinners. Though they all spin in the same direction on the review card, there is the possibility of them running in opposing directions for, as EVGA has shown, marginally better cooling potential. As normal, the trio turns off when GPU temperature is below 60°C or so. The cooling is robust enough but we come away with the feeling that the card isn't as premium as, say, the Founders Edition or XC Ultra Gaming. The fan shroud is plastic, and the only area of RGB lighting is with the Gigabyte logo on this side, controlled by the same app that enables the extra core oomph. The effect is reasonably muted, and it would be nice to see the GeForce RTX name RGB-lit, too. As this is largely a reference PCB, power is sourced via the usual 6+8-pin plugs and board TDP is a stock 225W. The back, meanwhile, uses a full-length aluminium heatsink that, unusually, does not feature a copper insert we have seen on sister company Aorus cards before. That's no bad thing as having a hulking amount of copper on the back hasn't previously shown to be very effective at removing more heat. 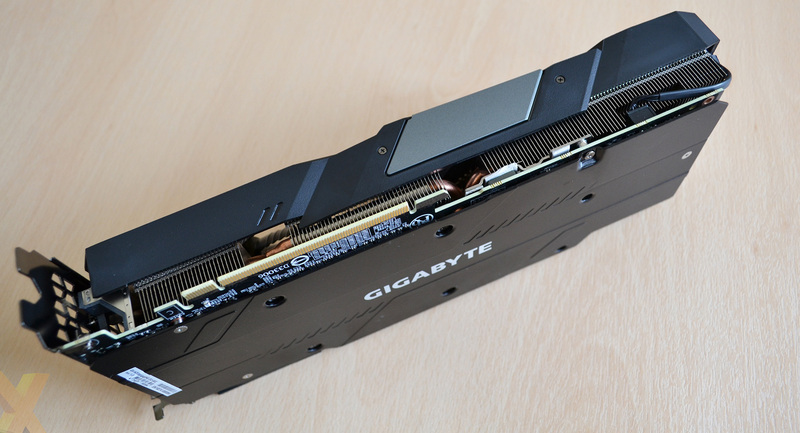 What Gigabyte has done is to put large heatpads between the hotter-running components and back heatsink. We know it works well enough because the plate becomes pretty damn toasty after high-intensity load. There are no surprises on the I/O section, just as you would expect, because the outputs and their locations conform to the reference card. Bear in mind that plenty of heat will escape back into the chassis because of the open-side design. We've not yet touched on price, which is £800 for this model, or £50 dearer than the FE and bone-stock models. The current state of play is such that we are not expecting to see lower pricing for a while, so if are in the market for a partner-overclocked RTX 2080, £800 is pretty much the starting price. The package is backed by the standard Gigabyte three-year warranty. Enough preamble, let's now get on to the benchmarks.